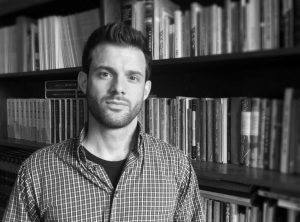 Moritz has been recently awarded the 2017-2018 Bernard and Fern Badzin Fellowship in Genocide and Holocaust Studies! Congratulations, Moritz! Moritz was born and raised in Berlin, Germany and moved to Minneapolis in 2013 to pursue his graduate studies. He received his M.A in Germanic Studies from the University of Minnesota in 2015. Before moving to the United States, Moritz had a vocational career in theater, stage lighting, and intercultural communication. He studied Cultural Studies (cultural history major, linguistics minor) at theEuropean University Viadrina Frankfurt (Oder), where he received his B.A. in 2012. Moritz’s teaching and research interests are modern European literary and intellectual history, German-Jewish history and modern Ottoman/Turkish history. Moritz is interested in the representation of the Holocaust and experience of exile in literature and the arts and focuses on the encounters of Holocaust representation with other forms of twentieth-century violence, specifically for the case of Turkey and the Middle East. Moritz is currently working on his dissertation project on the history of German and German-Jewish exile in Turkey during the 1930/40s. Focusing on the case of the literary critic Erich Auerbach (1892-1957), who wrote his most influential works on European literature while in Turkish exile and later in the U.S., Moritz examines the relationship of German-Jewish émigré culture to Turkish intellectual history. During the 2017/18 academic year, Moritz will conduct research abroad and begin writing his dissertation (prospective defense: Spring 2019).